Is steampunk NPIRL or isn't it? That is a question that has surfaced many times over the past few months amongst the members of the working group Not Possible IRL. As an example, Inigo Dench practically gave a dissertation on this topic here, way back in August and just a few weeks after the group was formed. I'd say that skin, clothing, accessories (and vehicles, you will soon learn) creator Pandora Wrigglesworth (rez: 10/25/2007), has laid the question to rest. In her dream-weaving hands, steampunk - that celebration of an Victorian era that never took place - can most definitely be NPIRL. 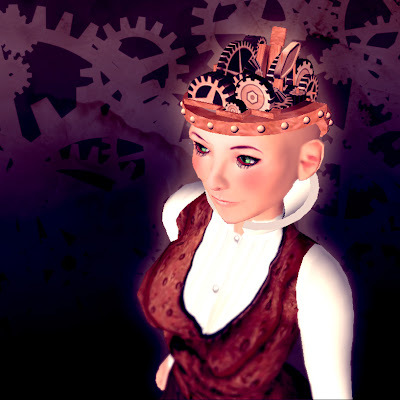 Take her Clockwork Automaton Lady skin, available in many metals and colors. Here, she has thoughtfully included adjustable leather straps (surely for those days when too much chocolate has added extra pounds), hidden all the cogs, and given the Lady an extra springy waistline. While Pandora - modeling the skin herself - is petite, gals of any size or girth are sure to charm whilst galavanting au naturel or fully garbed. In Pandora's Clockwork Brain, steampunk brain surgeons must have a degree in engineering, and buy all their supplies at the hardware store. Clockmakers, too, do a little moonlighting on the side to boost their Linden finances during periods of economic recession. Men and women alike appreciate the smart thinking behind (literally) her Topter hat which, in flight-mode, triggers springs that open the doors to allow for helpful propellers. Admittedly, the hat does jangle the nerves, but perhaps V2.0 will do a better job of suppressing the accompanying commotion. Not all steampunk design is about cogs and wheels. It often involves all manner of hidden compartments and trapdoors and, on the other side of the spectrum, the evidence - via exposure - of how things work. Corseted ladies understand best how important it is to be able to get-in-there and scratch, or perhaps make needed adjustments, and they were surely the inspiration for this layer that can be worn over skin or clothing. Per Pandora, it is perfect "for when you want to show people that, while you may be soft and warm on the outside, you are still cold as clockwork on the inside." Perhaps the most useful invention in Pandora's arsenal of goodies is the very surprising yet eminently practical gown shown below. "Here I am in my Horseless Gown, inside the Hall of Mirrors at Chateau de Versailles (teleport directly from here)," said Pandora. She added,"This gown is my most recent vehicle creation, a merging of the French pannier gown and the California "Woodie" roadster. I'm using low gear for indoor driving." Of course, this raises all sorts of questions regarding wardrobe registration and proper governance, but society will just have to find a way to keep up with all of the new scientific developments this steampunk fashionista is introducing. 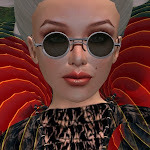 You may peruse and acquire these lovelies at her shop, Curio Obscura, by teleporting directly from here. All photography by Pandora Wrigglesworth. Don't worry about registration. The Horseless Gown features a six-character vanity plate on the back. I credit Pandora for reviving my joy for steampunk. 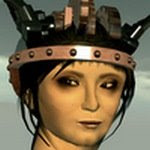 Her clockwork skins have redefined my look and attitude. Pandora's stuff is awesome! I bought the android skin the second I saw it. 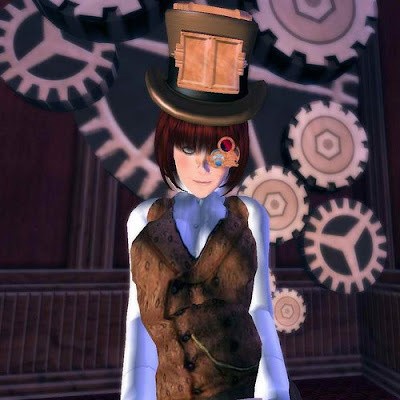 :) And the clockwork brain was something I have always wanted for my Second Life. I am in constant love with her loveseats. Maybe not steampunk, but beautiful and practical (can't beat 4 prims) nonetheless!